Stereoscopic digital photography trainer image. How to view stereoscopic images. How to view stereoscopic digital photographs – Machu Picchu in 3D! Stereoscopic 3D photography is not new. Photographers have been creating 3D images for as long as cameras have been around (have a look at the history of photography and digital photography). With digital photography it has become much easier to produce 3D images. This is because you can take as many photos as you like, and easily edit them to make a 3D photograph. If you don't know what these images look like click on the Stereoscopic(3D) home page for an explanation of how they work. Done that? Ready to view a 3D photograph? Then read on! Once you have had a go, please click on the "voting" form at the bottom of this page to let us know how you got on! 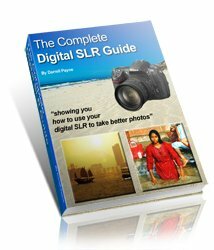 These pages on stereoscopic 3D digital photography, and digital-photography-tips.net itself, are updated regularly. To learn out about the updates as they happen click here to subscribe to the digital photography blog, and this site's RSS feed. Before we begin - a word of caution. 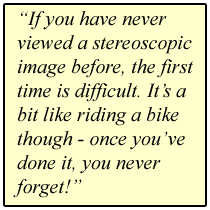 If you have never viewed a stereoscopic image before, the first time is difficult. It's a bit like riding a bike though - once you've done it, you never forget! Better still, once your brain has had a little practice you will find it really easy. And because your brain is being asked to do something it has never done before, it gives it a little work-out too! I should also add that the training image here is indeed genuine. This is not a trick to get people around the world staring at their monitors! Persevere with the image. Once you see the 3D stereoscopic digital photograph appear I bet you go "oh wow!" And once you have seen the picture, try making your own stereoscopic pictures. With digital photography, and some editing software (like PhotoShop) it's easy! Ok, the trainer image below is of Machu Picchu. If you ever get the chance to visit Macchu Picchu, do. It's an amazing place. But back to the stereoscopic image. When I took this digital photograph I actually took two pictures. One looking through my left eye, and one through my right eye. Such is the beauty of digital photography - take as many shots as you like - no need to worry about film! NB: actually the photographs were taken about 20 yards apart from each other in order to get better separation. The result is a better 3D effect. If you study both halves of the image carefully you will see that they are ever so slightly different. So, how do we view the 3d stereoscopic effect? Sit a comfortable distance from your monitor - about 24 inches away. Hold your index finger in front of your eyes, about 10 inches away. Then, ignore your finger, and just look at the picture on your monitor. You'll see something like the image below - your finger will "split" into two. NB:Try to line up the tips of your "split" finger with the red diamonds of the picture behind. Next step, bring your focus onto your finger, rather than your monitor. Your "fingers" will start to merge back into one, and the image on the monitor will shift. It should look something like the image below. Keep going, focus on your finger, and try to get the red diamond to appear just above your finger. It should look like the image below. Ok, you're nearly there! Hold your focus on your finger for a bit, just to get your eyes used to the focus distance. Then, shift your focus up just a little to the red diamond just above your finger. NB: If things start to shift on the monitor, just come back to focusing on your finger. Then try again in a few seconds. You aim now is to focus on that middle red diamond. Once you are comfortable looking at the red diamond, hold your focus. It might help to tilt your head a touch, to the left or right. 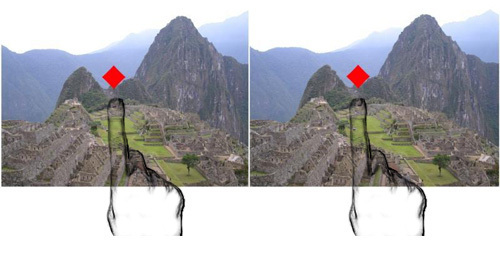 You should begin to see the 3D stereoscopic image of Machu Picchu appear! Subscribe to my newsletter, "Stay Focussed". You'll get the monthly newsletter and gain access to free subscriber-only content! I'd love to hear how you get on with my 3D stereoscopic image of Machu Picchu. Please spend a few seconds to complete the "voting" form below. Once you have "voted" you will see the results so far. If you are struggling, and can see that a lot of people are succeeding - keep trying! You will see it eventually! 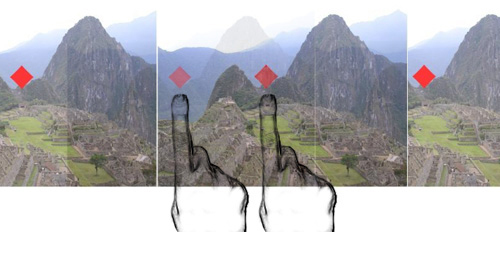 Please spend a moment to tell me how you got on with my 3D stereoscopic picture of Machu Picchu. Yes - saw the image in 3D! No - cannot see it.